There is a blast of energy being sent to us from the Divine. Some of us don’t know what to do with it. We are unprepared and may misinterpret it. We may feel like we are being hit with something confusing and disruptive. This is our natural defense against things unknown. We ask that you allow this energy to infuse with your own and receive the benefits that God is sending to you. It would be safe to accept this gift while meditating. Always perform your protection exercises prior to beginning. Ask that only your spirit guides and angels be present during this “download.” Do your best to hold only a bright White Light while you meditate. This energy is a very solid golden-white light. It is focused on your mind and third eye. It appears like the headlight of a train. The true color of this gift is blissfully blinding. You may feel light-headed but this will pass. We are being given a chart alignment adjustment. Sort of a reload of what you need to be doing in order to advance on your chart. You may have been distracted by erroneous things or emotional events. This boost will help to clear away any distractions and remind you where to go. Some of you have already blocked your energy infusion. Spirit states that you have crumpled it up and thrown it away. This is understandable since you did not know this was coming and didn’t understand what it was. This is why spirit is letting you know now. Relax and allow God to clear the way. Things will seem so much brighter. Coincidences will occur to make life easier and seemingly charmed. Many of your wishes will come to you if you are humble and appreciative. You may assist God to bring you this gift by envisioning your world brighter and more bold in color. Make your spaces white-gold. Imagine sparkles of light. Cleanse any dark energy from all of your spaces and refill them with God’s true love. Envision your cup overflowing, literally. It is possible to envision a cup or chalice that represents you and watch it overflow with golden white light. This is a good way to stay energized and motivated. Normally draining events will not hold you back. If you notice that you are losing your burst of positive energy then simply re-envision your cup overflowing again. Also flush and clear your head and third eye. Make room for God’s inspiration. Sit or lie down. Envision your head full of White Light only. Allow this light to flow abundantly through you and into the earth for cleansing. 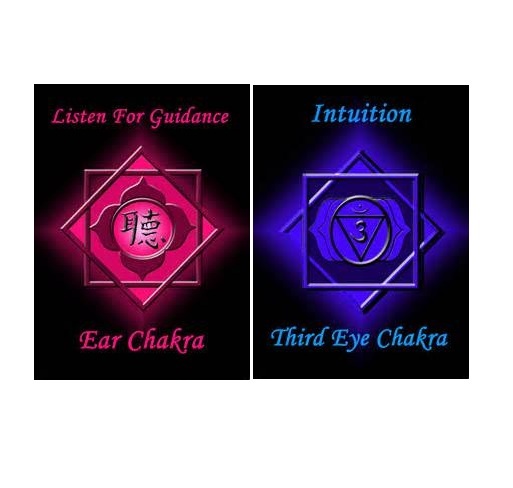 Boost the light and energy of your ear and third eye chakras Your ears are a red-violet and your third eye is indigo. Increase the intensity of this light until your eyes strain to look at it. Maintaining this clarity will help you utilize this wave of Divine inspiration. Remember to thank Mother Earth for accepting your cast off energy and ask her to repurpose it for something healthy and useful. Why now? We have a few more weeks before the Earth begins to ready for sleep again. We have all of our resources available to us now and we may accomplish a lot before the energy shift that comes with the next solstice. This may be the wane of Summer but look at it as your time to push forward and grow in wisdom and experience. Make some short and longterm plans. Decide what to focus on until we meet with the next holiday season. Always remember to raise your vibration. You ascend off of this planet with grace and beauty. Nothing may hold you back if you believe in your Divinity. Many of you are natural healers. You have followed a certain path and may have been brought to this site for a specific reason. We are here to teach you as we agreed to do prior to your incarnation. We are called “guides” and this is definitely accurate. We have influence upon differing areas of your life. Some of us focus upon your health, others focus upon relationships, more still focus upon past-life issues that have come to manifest trouble in this lifetime. What we wish to focus on now is healing. You are able to improve someone’s health or emotional state simply by sending them love. Imagine a person in your mind’s eye. Surround them with White Light. Be sure to envelope their entire being which includes the front, sides, back and inside. Any amount of Light will help but we would like you to make the most positive impact upon this person. You may hold this image in your mind’s eye and then say a prayer of healing. Do not set specific requirements or means. Please keep your prayer general so that spirit may decide the best approach to meeting your wishes. By placing specifics upon the request you will decrease the efficiency of the healing. Do this as often as desired. Spirit may develop a way of giving you updates on how the person is feeling. You may get a call from this person stating that they feel better or their health has improved. You may also be shown different colors or images when visualizing them. Green is healing. Emerald green is ideal. If you are shown a light green area then you may imagine shifting that color to a darker, richer emerald-green, which would signify progress toward healing more completely. Red is obviously something painful. Black is not positive. It may be a blockage or serious illness in the area it covers. Muddy colors show impaired functioning or illness. Blue is creativity and communication so a blue area may tell you that you’ve effectively sent a healing message. Or, if the area is a creativity or communication center it may represent a return to good health. Purple is spirit. A purple area shows some communication or interaction with spirit. Purple ears signifies hearing or listening to spirit. Gold is for God and Mother God. Use gold freely! Gold colors may also become muddy as well so renew your visualizations often. For now we won’t worry about where the muddiness or darkness goes. We will discuss that at a later time. For now, let it wash away as you flush the area with brighter, more healthy colors. Send loving energy and say a prayer of healing. Pay attention to responses or cues that you have helped this person in some way. Or, you may have to rely on faith that you have helped them. Keep the colors bright and vibrant. Change any muddy or dark colors to a brighter, clearer hue. This is so simple yet effective. Your energy and Light will be brighter because you have sent love and God’s healing to another. This is another step to increasing the Light we have in our world. Send love. Send God. Trust that you have improved our lives in some way!